Die-cast metal base with a well-defined swing arm detail; offered with either Murano wave-patterned glass or fabric shade. 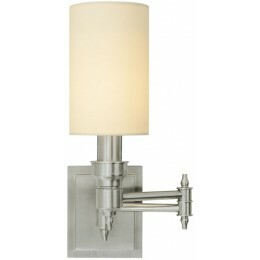 The Tech Lighting 600DRKWFLS Drake collection Sconce Wall Lighting uses Incandescent light output and brings Antique style. This item is 14.4"H x 7.1"W. The total wattage is 75 and the voltage is 120 volts. The Tech Lighting 600DRKWFLS requires 1 bulb (included). Additional Information: Shade-Linen Fabric; Control-Integrated On / Off Switch.